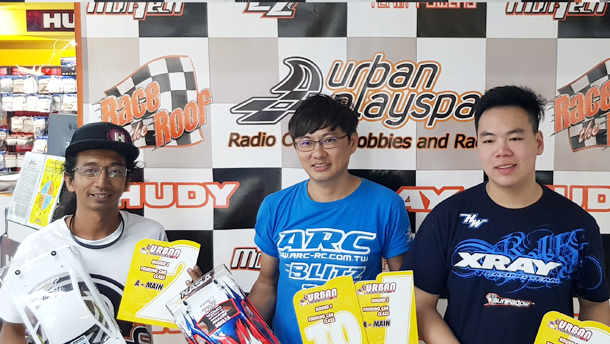 First electric race in Singapore of the 2019 season was held in Urban Playspace. The Urban Touring Series attracted a good number of entries to the first round including guests from Indonesia and Thailand. Two classes was competed for 17.5T blinky touring car and the Formula class. New motor rules were introduced by the organizer for the 17.5T blinky class where KV is limited to 2850KV. However, the organizer decided not to restrict the amp reading. In attendance was P.Y.Tang representing Team ARC and Muchmore, running the ARC R11 version 2019 and full Muchmore power and electronics. Speaking with P.Y., Muchmore Fleta ZX V2 17.5T ER was the most popular motor in the 2018 season, but after the rule change was first introduced, the same motor would seem an impossible task to compete with the rest of the listed motors for the 2019 UTS. Having camped at the track for almost 2 weeks prior to the race, with the assistance from his sponsors, P.Y. tried almost every car setup and electronic setup that he can managed, eventually found himself a very good package that saw him taking the TQ and the overall win. Posting the fastest lap record at 11.147s, P.Y. was relieved that all his experience in stock racing was put into good use. P.Y. Tang topped Q1 and Q2 to secure the TQ spot, while a surprising on-pace Esmail Apandi snatched 2nd from the 2018 UTS champion, Dominic Quek from Xray in 3rd. P.Y. went on to win all the three main finals to secure his first UTS win. Esmail Apandi finished in 2nd and Dominic Quek in 3rd.